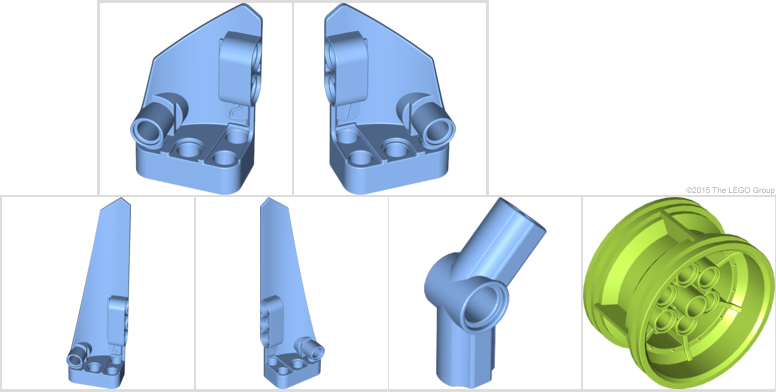 Today we have our first ever proper examination of new Technic parts, courtesy of Ryan W. (merman) who is a member of Dutch LEGO® User group, Lowlug. Aside from his long-standing appreciation of Technic, Ryan is also the proud owner of every Modular building and, since he is also a film critic, some big Star Wars and other movie-related kits, such as The Lego Movie. As a kid I was an avid fan of LEGO and as I entered those confusing teenage years, I shifted my attention from City and the occasional Space to Technic in the mid-eighties. To me there was an immense fascination emerging from the use of axles, beams, pins and especially gears. Then those notorious Dark Ages sifted in and when I got out of them I was a university law student and Technic had all changed. Sometimes I visited toy stores, not quite ready to spend my scholarship on plastic toys. But I left the store overwhelmed with questions. What happened to those famous studded beams? Why did LEGO decide to let their Technic line-up be dominated by flexible axles, hoses and those hideous panels? Soon everything got better and Billund not only improved their dreaded panels, they were improving Technic as a whole. The Dark Ages were over after I purchased 8285 Tow Truck. And studless building turned out not only to be more compact and complex, requiring you to think ten steps ahead, but also the overall look of the sets had improved considerably, making the old studded Technic sets from my childhood look blocky. The general AFOL (if there is such a thing) is not crazy about Technic. Reading online set reviews, I notice negative comments very often relate to an extensive use of Technic pieces. Too much clicking and too little snapping, seems to be the consensus. But over the years, Technic has become an integral part of System sets, including Creator and Star Wars. Iconic sets such as 10179 Millennium Falcon and 10221 Super Star Destroyer would have been impossible without the (studded) skeletons that support and define them. The White Swan, 10212 Imperial Shuttle, is a good example of how studless beams can accompany studded bricks, plates, wedges, slopes and arches perfectly well. Basically, nearly all product lines have benefited from Technic. So why not give it some more credit? Since I live in a small apartment on one of the busiest, touristy canals of Amsterdam, I simply have no space for loads of Technic sets. So, usually I just buy the annual flagship set and order the remaining new parts directly from LEGO. 2015 is already turning out to be a wonderful year with very useful new Technic elements, including a revolution as well as solution of a well-known building issue among Technic MOC'ers. Let's take a closer look. To start things off simple, let's focus on pins for a while, the most basic Technic element imaginable. But we could not live without them. In 2009 LEGO started to extend its color-coding policy for pins, a development it already had initiated a year earlier with gears. For axles this policy is even older. Not all Technic fans were amused LEGO decided to change the color of the Pin Long with Friction Ridges Lengthwise (Design ID 6558) from Black to Bright Blue [TLG]/Blue [BL]. Looking back, it was not such a drastic change, considering the fact Axle Pin with Friction Ridges Lengthwise (Design ID 43093) had been blue since 2002. The current color-coding strategy for pins is quite reasonable. Light colors indicate pins without friction; their darker next of kin are a bit sturdier and have friction. 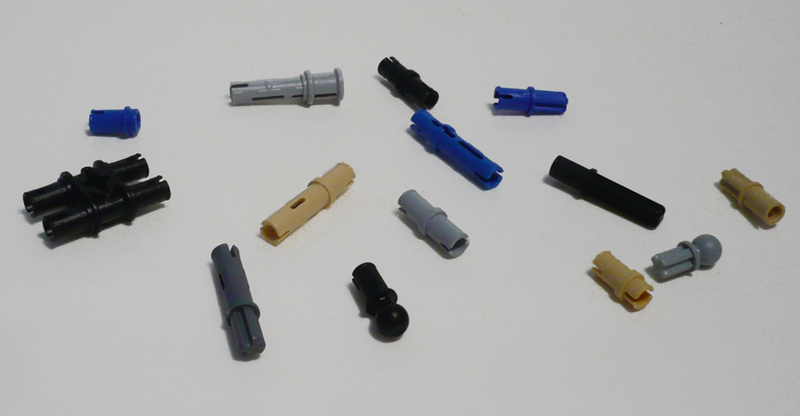 It certainly helps younger builders to easily distinguish the ever extending assortment of pins. Last year we saw the introduction of Axle Pin 3L with Friction Ridges Lengthwise and 1L Axle (Design ID 11214). This year its similarly-useful counterpart has arrived, coming in Black thus indicating it has friction. Since it is more axle than pin, one could also name this new part a Pin Axle. The official TLG name is Cross Axle 2M with Snap with Friction (Element ID 6089119 | Design ID 18651). Since pins are primarily meant to connect, the use of the new Pin Axle may not tickle the imagination to the max. But it could for example provide friction to winch mechanisms, like the current use of the short Axle Pin for these situations. Still it is an extremely useful part that offers new ways of connecting beams, liftarms and connectors which other themes than Technic could also benefit from. The whole family of Pins and Axle Pins seems to be complete for the moment, although a 4L Pin with Friction might be another welcome addition. 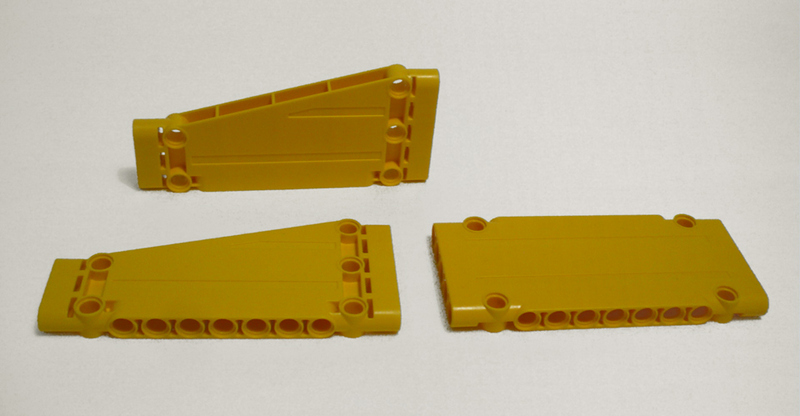 The frequency of this new part in the first wave of the 2015 Technic sets is pretty scarce. You will find two of these pins in the cute 42031 Cherry Picker and eleven in the 42038 Arctic Truck . It's also in seven other sets from other themes. The standard studless beam and liftarm assortment is restricted to odd lengths, as opposed to the even length of studded Technic beams. Some smaller and bended beams are the only exceptions. The smallest beam imaginable would be just one stud wide. 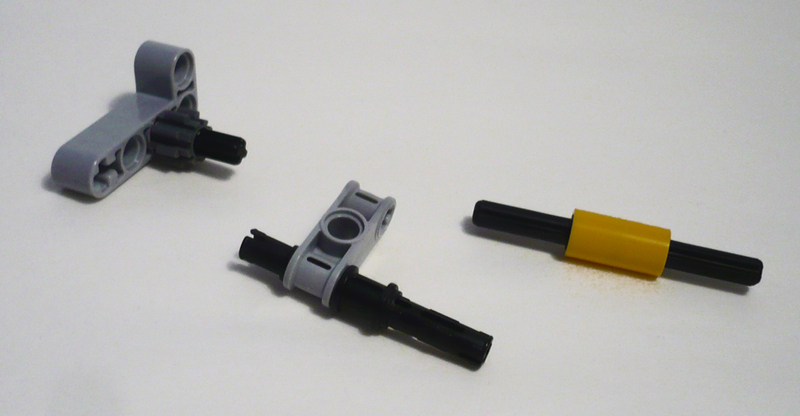 A pretty useless element at first sight, but it was finally introduced anyway in two of the 2015 Technic sets: the Beam 1L comes in the following new 2015 sets: one in 42036 Street Motorcycle and six in 42038 Arctic Truck . It has also been spotted in some other 2015 product lines. Its element ID is 6100030, the design ID is 18654 and it only comes in Dark Stone Grey [TLG]/Dark Bluish Gray [BL] for the time being. So far, the use seems limited, only serving as an axle or pin filler, but it could provide some nice smooth ornamentation in System sets as well as a crank handle. Every part needs mold marks, where the plastic gets injected. I have the compulsive obsession of making the mold marks become as invisible as possible in my builds or make them appear symmetrical. This is rather impossible with this small part, although I would not have any suggestions where else to put it. Much more interesting and useful is Element ID 6089147 | Design ID 18677, currently only available in Light Stone Grey [TLG]/Light Bluish Gray [BL] , that serves as the counterpart of the Plate Modified 1 x 2 With Pin Hole (Design ID 11458) introduced in 2013. I love those parts that integrate studless building with studded building. You’ll get two in 42031 Cherry Picker and the same similar amount in 42039 24 Hour Race Car . It's also used in 8 sets from Chima and Star Wars. Along with the introduction of studless building came new panels that simply served as a way of filling up gaps in Technic constructions. Several incarnations of panels appeared since then, the latest batch stemming from 2006. Generally the holes in the panels have been reduced over the years and the ones introduced eight years ago are by far the most elegant ones. The year 2015 gives us one new panel and one new mudguard. First of all set 42035 Mining Truck gives us a Bright Yellow [TLG]/Yellow [BL] panel (Element ID 6099546 | Design ID 18945). 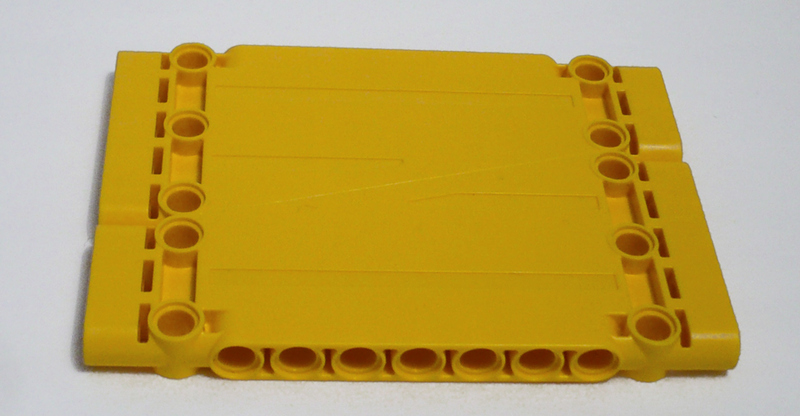 It has dimensions of 11 x 5 x 1 studs and on one edge is truncated to just 3 studs. Basically it is a truncated version of the Panel Plate 2 x 11 x 1 (Design ID 64782), shown on the right in the above picture. A nice detail is that the diagonal edge has three interior supports. The new panel can also be joined at the diagonal side to create a larger 8 x 11 panel. Unfortunately, the ridges on the surfaces of the panels do not line up. 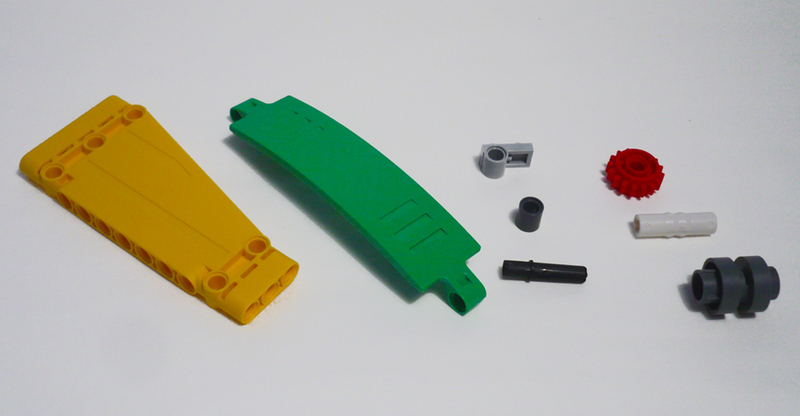 Set 42039 24 Hour Race Car introduces a new mudguard with dimensions 3 x 13 in a color new to Technic: Bright Green (Element ID 6097208 | Design ID 18944). Buying the set allows you to add eight to your collection. This panel does not give you many options other than covering wheels, but it might be useful for curved surfaces also. I have saved the best new parts for last. There were times in which the now common Driving Ring (Design ID 6539) was a pretty rare part only used in the classic Technic Super Cars. Back then the Bricklink price of this part was well over £5 each; these days the Driving Ring shows up in sets a couple of times a year. Since the last ‘real’ Super Car of 2001 (as I consider set 8466 to be one of those), it has appeared in the staggering amount of 29 sets. Its color became restricted to just Bright Red [TLG]/Red [BL]. The two stud wide Driving Ring, which serves as a clutch between two opposing 16t gears, had one immense issue that drives both the Technic designer and the builder to insanity: since it is two studs wide and the lever (called a Changeover Catch, Design ID 6641) that operates it is in the center, a half stud offset is necessary. Since studless building is based on odd stud lengths this causes many difficulties - or let’s call them design challenges. We have seen many examples in official sets where either the gear or the beams need to be corrected by half a stud. In 2015 a new Driving Ring with a three stud length has been introduced (Element ID 6100931 | Design ID 18947). It does make constructions - especially gear boxes - a stud wider, but it is far more practical. It comes only in Dark Stone Grey in sets 42038 Arctic Truck and 42039 24 Hour Race Car . The new Driving Ring works a lot smoother than the old one, requiring less force to switch between functions. The good old Changeover Catch still survived, but a new ribbed connector was developed to make the new 3L Driving Ring slide (Element ID 6100932 | Design ID 18948). The sliding of the Driving Ring is pretty smooth, giving a nice click caused by the center lip of the ring. 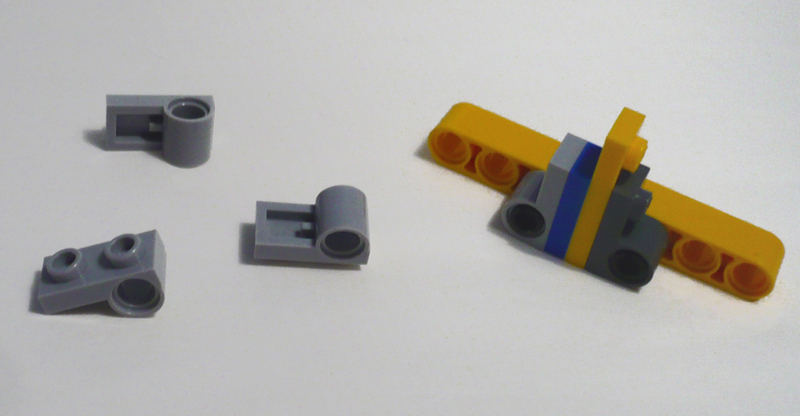 It looks like the plugs used for screws in your wall and it is an odd choice to make it available in White instead of the Brick Yellow [TLG]/Tan [BL] which the old part for the same purpose, the Axle Connector (Ridged with x Hole Orientation), has been since 2006. This could also provide ornamentation for Modular Buildings or other sets. 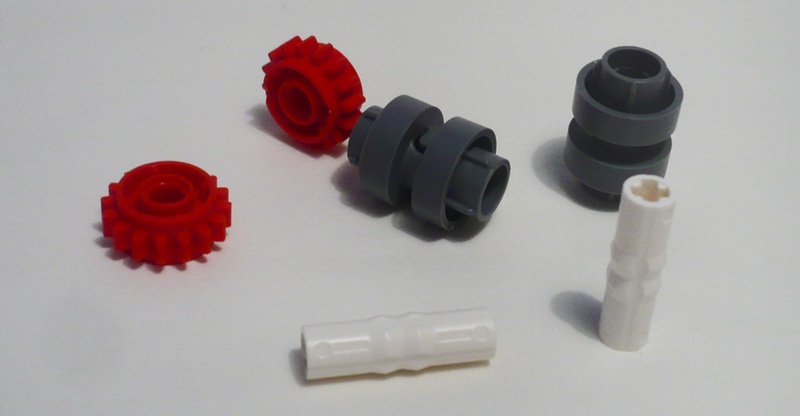 With a new Driving Ring system comes a new 16 tooth gear, which LEGO decided to make Red (Element ID 6100930 | Design ID 18946). It is pretty much a double sided version of the old Gear 16 Tooth with Clutch, Smooth [BL] (Design ID 6542). It has two notable dents on one side for no obvious reason other than molding. It has probably been revised to avoid confusing which side of the gear to use with the Driving Ring. It also enables you to use Driving Rings on both sides of the gear, even though I do not see the purpose of that at the moment. The old gear has not been phased out however, since it is also used in the new 2015 sets. It now pretty much serves as a transition gear that can rotate freely on an axle and even a pin. The new Driving Ring also works with the Driving Ring Extension (Design ID 32187). There are, however, restrictions with the old Driving Ring and the new gear as shown in the pictures below. Just as the extension part has been used in other themes, most notably Star Wars, I can imagine the new Driving Ring will serve in cannons and other weaponry as well as for ornamentation. To wrap things up, let’s have a quick look at recolors. I did not order all of these since my wallet did not allow. Dark Green [TLG]/Green [BL] made a major comeback in 2013’s 42008 Service Truck, but 42039 24 Hour Race Car uses Bright Green, a novelty in Technic. Besides the new Mudguard piece you get an assortment of studless beams, panels and axle joiners in Bright Green. Set 42036 Street Motorcycle and 42037 Formula Off-Roader give you an assortment of panels and even an Axle and Pin Connector in Medium Blue. The latter set also gives us wheel rims in Bright Yellowish-Green [TLG]/Lime [BL]. 42038 Arctic Truck is a good parts pack for Bright Orange [TLG]/Orange [BL] beams and panels. Last, but certainly not least, the Axle and Pin Connector Hub with 2 Axles [BL] (Design ID 10197) now also comes in Black. Consider using our affiliate links to buy your 2015 Technic sets (or anything); this helps support New Elementary! The '1 stud beam' is the second element of its type. 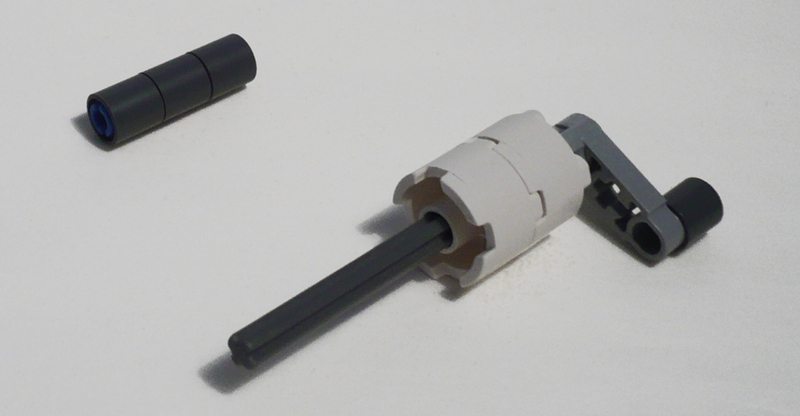 http://brickset.com/parts/design-6221 was introduced in 1995 and saw some action in Technic sets of the time on crank handles. My friend would like more pastel "Friends" colors in Technic sets. I've never built a Technic set, but have used it enough in other themes to be surprised that I've never connected the color of the pieces to their friction. That being said, I find this concept intriguing. I may even cave and buy a real Technic something or other. Lots of interesting pieces, and I'm thrilled to see that they could serve completely different purposes in system sets as well. I think that 1-hole beam will be used a lot for stud reversal in close quarters. And those curved mudguards, once available in grey, might even serve as big leaf springs or something similar. And I can't unsee the use of the shifting axle as a straw. Great to have these elements here on NE as well! New Elementary is not associated with the LEGO Group. LEGO® is a trademark of the LEGO Group of companies which does not sponsor, authorize or endorse this site. All text and images are © 2013-2018 New Elementary unless otherwise attributed. Powered by Blogger.